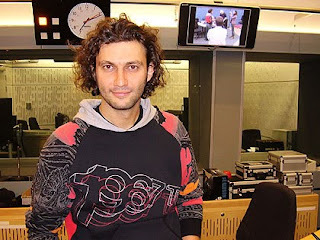 There is this singer, Jonas Kaufmann. I like him. Jonas Kaufmann is a tenor but he almost sounds like a baritone. He has that kind of depth to his voice. He is from Munich, I think. That is a funky picture of him up above. I heard him the other day in "Die Schoene Muellerin." You want to get my attention, let me hear you in "Die Schoene Muellerin." Every time a new one comes in I drop everything. I collect performances. I have about 25, I think. 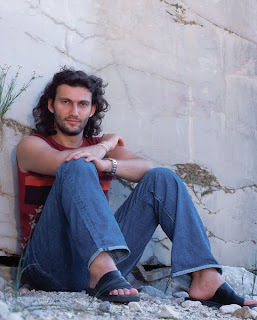 Here is a hippie picture of Jonas Kaufmann. It reminds me of Grateful Dead concerts I attended. Ha, ha! I guess there has been a kind of flap because Jonas Kaufmann complained that he was being presented as eye candy. "Totty" is the quaint word they use. It must be British. You can read about that flap, as I eagerly did, on this fine Web log here. To accompany your reading here is "Der Zurnende Barde" ("The Angry Singer") by Schubert. This is a great song and a dandy performance by Dietrich Fischer-Dieskau. Back to Jonas Kaufmann's voice. Here is a recording on YouTube of my new friend Jonas singing the first two "Schoene Muellerin" songs. This is kind of like a dream video for me. In the car, or anywhere, listening to this song cycle, I always take forever to get past "Wohin." Even though I love the whole cycle and know it by heart, I will keep listening to those first two songs over and over again, into eternity. I get like some kind of robot. You have to reboot me. I have special feelings for them because when I went to California to get with Leonard Pennario, I had that moment of panic in the parking lot of work because it struck me I had just met this guy, I had no idea what I was doing. Then I heard those first two songs and everything was better. I wrote about that on this Web log, I remember that now. I wrote about it the first day. I am fussy about these songs the way you get when you love something. "Das Wandern," I do not want it too fast or too slow. I want the piano strong and hearty. I want the singing strong and hearty too. Tenors do not always do it for me. Yes, I like that aspect of "Die Schoene Muellerin" too! And how Jonas Kaufmann sings it, I agree with you on that. It is proof that cultures can come together over the music of Franz Schubert.